Once you’re done entering the Grand Giveaway, or if you’ve already entered it, be sure to enter my giveaway below! The Valentine’s with Bite Giveaway runs from February 10th-24th. The Grand Giveaway is open internationally and my giveaway is international too! What Can You Win From Me? Books 1-7 in my Eternal Mates paranormal romance series in your choice of eBook or Audiobook! My grand prize is worth $32.93 if you love eBooks or $191.58 if you prefer Audiobooks. Wow! Please note, that you’ll need to have an audible.com or audible.co.uk to receive the audiobooks. Plus, a FREE EBOOK for everyone! » DOWNLOAD THIS FREE EBOOK NOW! Now fill in the Rafflecopter form, and remember to do the optional entries for more chances of winning! 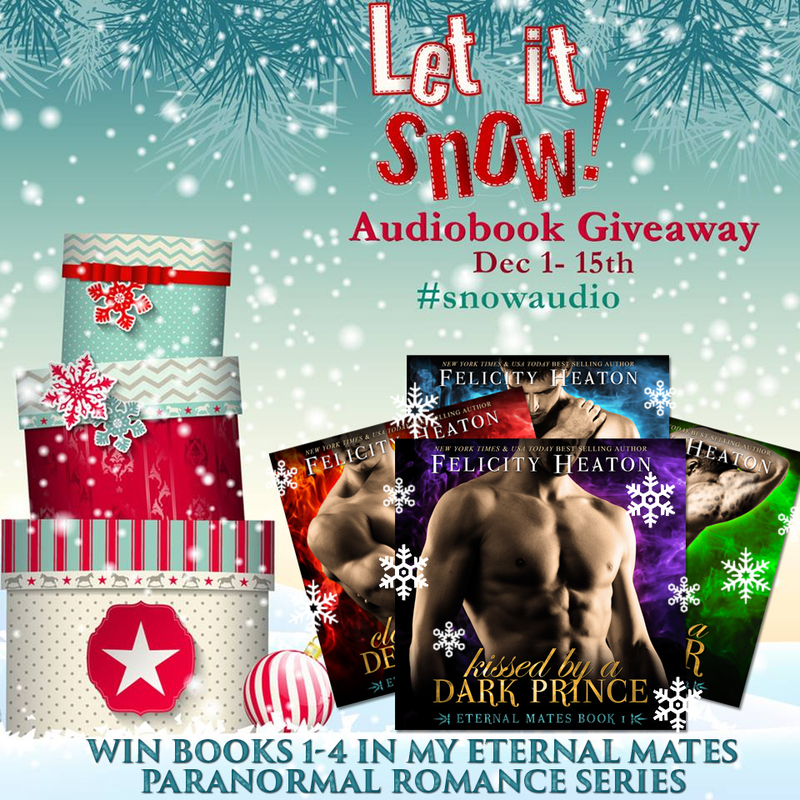 #SnowAudio Giveaway – WIN books 1-4 in my Eternal Mates Paranormal Romance Series! It’s the time of giving, and loads of authors have come together under the hashtag #SnowAudio to bring you a little seasonal spirit this winter. Just search for that tag on Facebook, Twitter or Instagram and get entering the fantastic giveaways between now and December 15th. I’m giving you the chance to win one of two sets of books 1-4 in my Eternal Mates paranormal romance series in audio. Posted in Claimed by a Demon King, demons, Eternal Mates, giveaway, Hunted by a Jaguar, Kissed by a Dark Prince, paranormal romance, shapeshifter romance, Tempted by a Rogue Prince	| Comments Off on #SnowAudio Giveaway – WIN books 1-4 in my Eternal Mates Paranormal Romance Series! Once you’re done entering the Grand Giveaway, or if you’ve already entered it, be sure to enter my giveaway below, and then check out the list at the bottom of this page for links to the other authors in this hop and their giveaways! The Monster Halloween Giveaway Hop runs from October 21st – November 3rd. The Grand Giveaway is open internationally and my giveaway is international too! I’m giving you TWO chances to win books 1-7 in my Eternal Mates paranormal romance series in your choice of eBook or Audiobook! That’s a prize worth $32.93 if you love eBooks or $191.58 if you prefer Audiobooks. Wow! Ares (Guardians of Hades Romance Series Book 1) – Out Now! It’s finally here! After working on this series since 2008, and sitting on the first draft of this book since 2012, I have finally managed to squeeze releasing the very first book in the Guardians of Hades paranormal romance series into my schedule. Posted in 2016 releases, Ares, giveaway, greek gods romance, Guardians of Hades, new release, paranormal romance	| Comments Off on Ares (Guardians of Hades Romance Series Book 1) – Out Now! Mystery Box Giveaway #3 – WIN a signed paranormal romance book and more! It’s time for a new Mystery Box Giveaway! Enter this giveaway to be in with a chance to win one mystery box prize that includes a signed paranormal romance paperback from my back list, plus signed book swag from my collection of book cover flats, bookmarks, pens, temporary tattoos, keyrings, etc. Giveaway is international, and will end on November 20th, with the winners drawn on November 21st. Posted in giveaway	| Comments Off on Mystery Box Giveaway #3 – WIN a signed paranormal romance book and more! 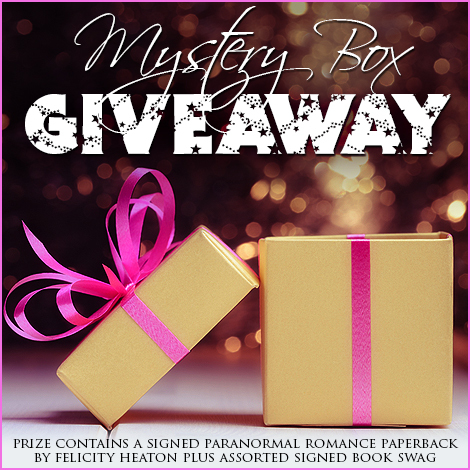 Mystery Box Giveaway #2 – WIN a signed paranormal romance book and more! Enter this giveaway to be in with a chance to win one mystery box prize that includes a signed paranormal romance paperback from my back list, plus signed book swag from my collection of book cover flats, bookmarks, pens, temporary tattoos, keyrings, etc. Giveaway is international, and will end on November 10th, with the winners drawn on November 11th. Mystery Box Giveaway #1 – WIN a signed paranormal romance book and more! Enter this giveaway to be in with a chance to win one mystery box prize that includes a signed paranormal romance paperback from my back list, plus signed book swag from my collection of book cover flats, bookmarks, pens, temporary tattoos, keyrings, etc. Giveaway is international, and will end on October 30th, with the winners drawn on October 31st. It’s day 14 of the Awakened by a Demoness Blog Barrage and it’s almost the end of this awesome barrage so don’t forget to enter all the giveaways, including my one linked below. It’s day 11 of the Awakened by a Demoness Blog Barrage and time for another update with links to all the latest posts. Don’t forget to visit them and enter the giveaways! It’s day 7 of the Awakened by a Demoness Blog Barrage! I’ve been too busy to post with the updates, but I’ll try to keep them more consistent from now on!